In the spring of 2015, Chris Mears was in supermarkets handing out samples of his new premium, M&M-style candies, called Little Secrets. “Oh,” one woman said, “this is perfect for my kids.” Another customer ate a chocolate and said, “I didn’t think it would taste this good!” Both were meant as compliments, but they made Mears anxious. His candy wasn’t for kids. And quality shouldn’t have been a surprise. The problem was easy to diagnose. “When people say things like that, it’s clearly a packaging issue,” he says now. The premium-­chocolate market is full of self-serious brands like Ghirardelli, and he’d wanted something more welcoming. He imagined his candy appealing to 30-somethings after a long workday, so he created a bright, busy bag. To riff on the name (a nod to how people tend to eat chocolate alone), he added mythical creatures like unicorns. But as he discovered, this all made his candy look cheap—turning off customers and many major retailers. 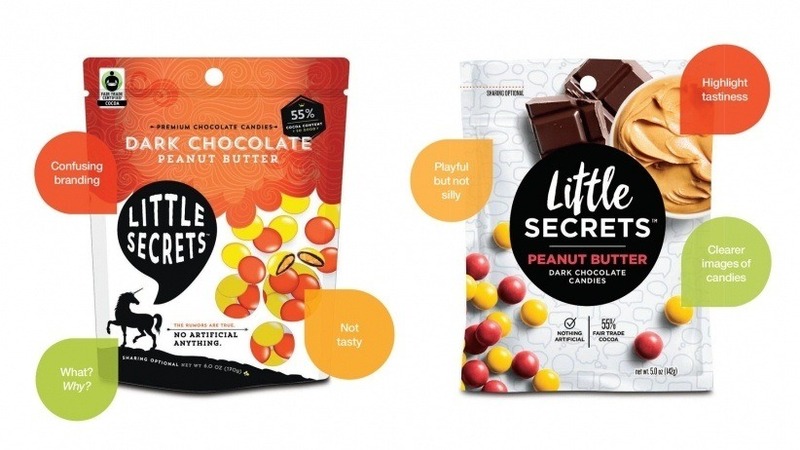 By that summer, he’d hired a new design firm to remake the packaging—and after four months of not seeing what he wanted, hired yet another firm, Beardwood & Co., to get it right. “Create a mouthwateringly delicious, mind-blowing candy-coated chocolate brand,” he told them, and he gave them a hierarchy of information to appear on the new bag. First consumers should see his brand’s name. Then the chocolate and the flavor (he makes coconut, peanut butter and more). And finally, what makes his chocolate special: It’s fair-trade, with no artificial ingredients. The result was clean but playful, with the brand name surrounded by tasty food images. It rolled out in May 2016 and clicked with retailers. Little Secrets quickly quadrupled the number of stores it was in, to about 4,000, and national chains that once said no were now saying yes. But something still wasn’t working. Mears showed consumers his new bag and asked, “What is this product?” The answers were wild. “I had some say, ‘Is it a trail-mix-type thing?’ And I was like, wow, that’s so interesting, because people are just so literal.” The bag says “dark chocolate candies,” but their eyes went to the food images and skipped everything else.